‘We are sure the term “green motor yacht” sounds like an oxymoron to a lot of people,’ says the owner of the new 39.3 metre expedition yacht Safira. 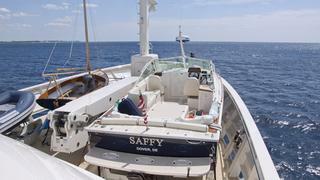 But this experienced owner knows that yachting definitely can be greener, and Safira proves it. Also the owner of a number of properties that are certified LEED Platinum, the highest level of Leadership in Energy and Environmental Design, he was in an excellent position to bring ‘green’ to yachts. He and his wife are also no yachting neophytes, having owned Mosaique, a 50 metre displacement Proteksan Turquoise, and Muse, a 37.5 metre fast Palmer Johnson. ‘Having had a slow-moving displacement yacht and a faster-moving semi-displacement yacht before, we realised it was much more important to us to get from A to B in comfort than with speed, hence the move to an expedition/explorer design,’ says the owner. About the only guideline he gave designers Sparkman & Stephens was a preference for a cab aft look, with the tenders and toys stored forward. Power for this explorer would be delivered by azipod drives – the Schottel Rudderpropeller – which, according to Captain Walter Wetmore, are about 20 per cent more efficient than conventional shafts. In addition, the Caterpillar C32 ACERT engines can run on 15 per cent biodiesel. LED lights throughout and good insulation reduce the electrical load and allow Safira to carry smaller generators, which use less fuel. On deck, Dutch product Esthec replaces teak. The attractive composite decking resembles wood but is ecologically sound both in manufacture and maintenance. It also serves to cushion the boat deck, reducing sound transmission to the crew quarters beneath. In the interior, each material was chosen for its environmental friendliness. The cabinetry, built by Westhoff Interiors is of forest-certified sapele. 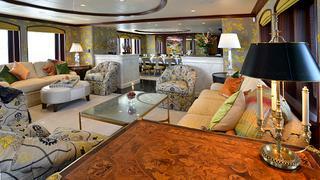 It is also used relatively sparingly, offset by exquisite embroidered silk wall coverings. The floor throughout the guest areas is reclaimed oak, wood discarded from another project and re-milled to be new. All the stonework on board is made from remnants, leftovers from other projects, and hence considered ‘green’. All these materials are brought together in a design scheme that is bright and cheerful. Having worked with the owner on many other projects, designer Michael Shewan, head of Michael David & Associates, entered this project with a clear understanding of the owners’ personalities, but unsure exactly how they wanted Safira to take shape. ‘We sat down with 11 years of The Megayachts books to get an idea of what they wanted,’ says Shewan. A classic design evoking calm and serenity was the answer for this couple. The main saloon shows this with quiet sophistication and a hint of art deco, a period of design that appeals to the owners. Faux ivory cabinets separate the lounging and dining areas, and while most furniture is custom built to look old, an antique Louis XIV desk is the exception. 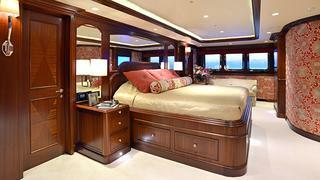 Based on past experience, the owners chose to have the master suite below decks, amidships, the position of least movement on board. ‘We only go to the bedroom to sleep, so having interesting views from the stateroom was meaningless to us,’ says the husband. The master suite is nonetheless spacious, stretching the full beam, and elegant with red and silver silk walls offering another touch of art deco. Captain Wetmore says the sound attenuation in the room is amazing, thanks to the sound-deadening quality of the extra-thick door, as well as the walls and floor. In addition, a sound curtain runs from the top of the wall to the deckhead, so each cabin is isolated from the other. Where the owners do plan to spend their waking hours is on the top deck, which has been optimised for outdoor enjoyment. A spa pool forward is adjacent to a pair of cocktail tables, so those both in and out of the water can socialise. A large bar area looks ideal for the chef to do serious grilling, and there is an easy flow to the arrangement. ‘There is no dominating large table to trap guests in one sedentary location,’ says Shewan. The owners envision the upper saloon as their second-most used spot. This is the ‘fun room’, as Shewan says. Indeed, splashes of purple and lime give an upbeat feel to the space. 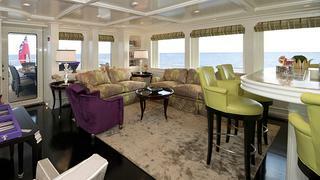 There are two seating areas with a pop-up TV, a well-equipped bar is aft and bookcases fill the corners. 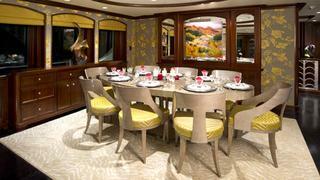 Forward of the main-deck commercial galley (fitted with LEED-certified appliances) is a crew lounge to port. The captain’s cabin is opposite, finished to guest standards. Down and forward are three relatively spacious cabins for six crew. On the way is the laundry area, from which crew can enter the sub deck. This practical space offers walk-in freezers and refrigerators, dry stores, locker space for crew belongings, a bottle crusher and a rubbish freezer. From here, crew can access the guest accommodation space aft for servicing. Above the crew quarters is the vast boat deck, which carries an impressive number of tenders and toys for a yacht of this size. A 7.6 metre Hunt Harrier dayboat is the largest, launched via a 3,600kg crane. These toys will come in handy when Safira enters the charter market. She will be available this summer for charter in New England, and the owners also plan to take her farther afield to the east coast of Canada and Greenland. With an 8,000 nautical mile range at 8.5 knots, Safira is built for it. Extreme latitudes are possible with her ice-strengthened hull and A4 radio class, which gives her communication capabilities at the poles. Forward-looking sonar aids her go-anywhere spirit, and Quantum Zero-Speed stabilisers make ride and anchorages comfortable. While the owner may have set out to show that motor yachting can be greener, Safira shows this can be achieved with nothing lost in comfort and functionality. Quite the opposite, actually – she has ample supply of both. The yacht is now ready to take her owners and charter guests on adventures while leaving the smallest possible carbon footprint in her wake. 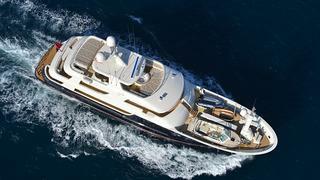 Does the eco-friendly superyacht exist?